Mom was right. Sometimes the best things come in small packages. This tiny gift of pure silk brings great comfort and peace of mind for yourself...or someone else. Comfort is one thing: this luxurious silk blanket, pillowcase and eyeshades helps make sleeping on a plane a dream. Airlines now rarely make pillows and blankets available. And when they do, they apparently don't clean them very often. It makes sense to have a personal pillowcase and blanket for those long airplane rides. Great for for trains, buses and cars too! silk eyeshades to sooth the eyes and block out the light. Everything rolls into a 12" bag with a total weight of less than a pound! And, it's a cinch to get it all back in the bag! 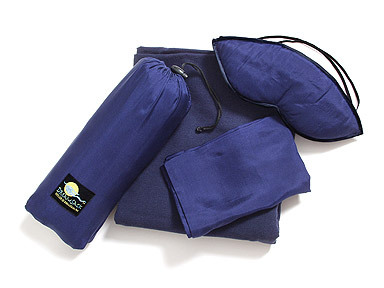 How do you care for the DreamSack Airplane Comfort Set? Easy! Wash your DreamSack by hand or in the washing machine on the gentle cycle. Use cool water and mild laundry soap. Hang to dry. They dry quickly.